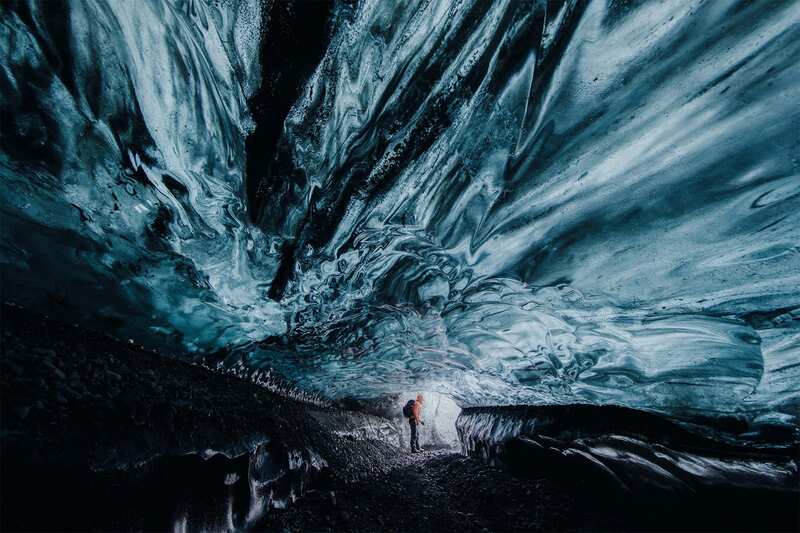 Join us to explore the south coast of Iceland, witnessing Iceland’s largest glacier and Jökulsárlón glacier lagoon, while still having time to hike to and explore the stunning beauty of one of Iceland’s most spectacular ice caves. 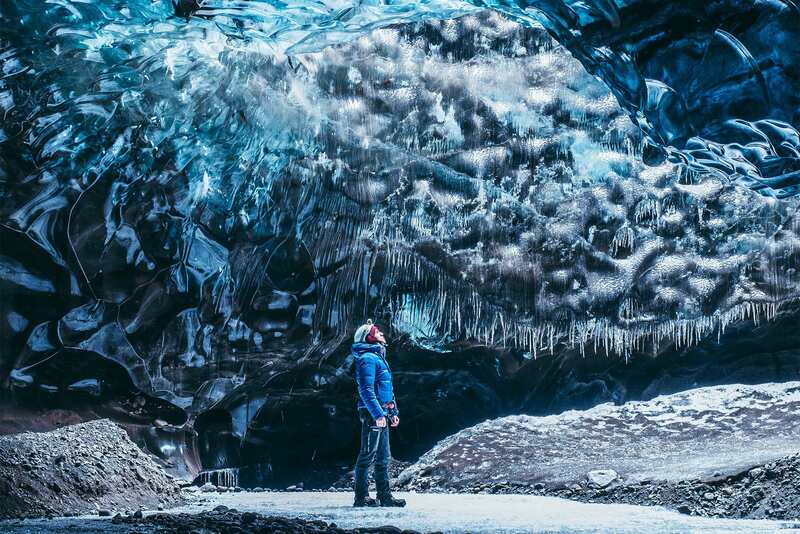 Our Jökulsárlón Glacier Lagoon & Ice Cave Experience two day tour is the perfect option to become captivated, and fall in love with the astounding natural beauty of Iceland. After leaving Reykjavik, we head straight for the impressive Seljalandsfoss waterfalls, which we are able to walk behind for the ultimate view, if conditions permit. 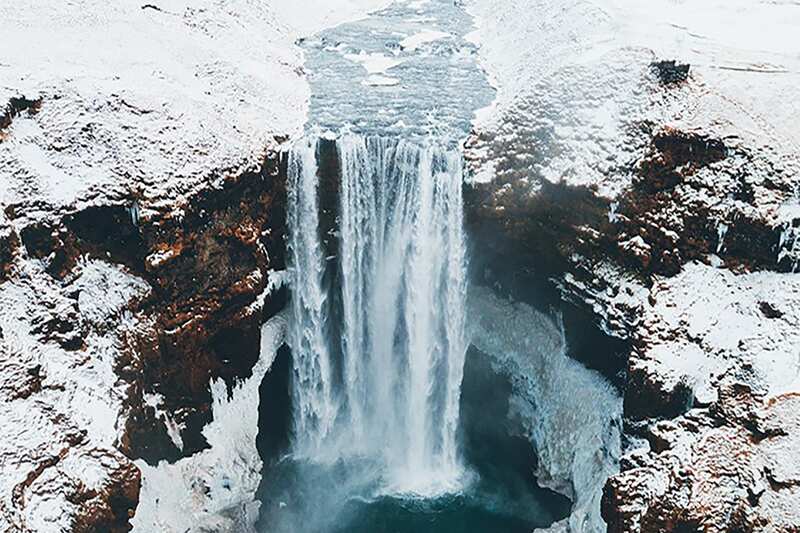 Next is the powerful Skógafoss waterfall, which is a sight that you will not soon forget! From here we will drive to Reynisfjara , where you will be astounded by the amazing black sand and basalt columns. It is this incredible location where we will stop for lunch at the Black Beach Restaurant. After lunch we will continue east to explore Fjaðrárgljúfur*, where you can see the impressive forces of nature that have eroded this spectacular gorge. Further east, we will drive past the mighty Vatnajökull icecap, where we will be dwarfed by Iceland’s highest mountains. We spend the night at the new and incredibly comfortable Lilja Guesthouse, resting up for another action packed day. Recently completed, rooms are finished with modern fittings and private bathrooms. Dinner from the kitchen at Lilja Guesthouse is always delicious, with the chefs taking advantage of the fresh, local Icelandic produce. With favorable conditions in winter, we will hunt for the magical northern lights. In December and January when Lilja Guest-house is closed, we will be staying at which is also perfectly located, and has wonderfully comfortable rooms and delicious local food at their restaurant. We start the day with the delicious buffet breakfast (included) from Lilja Guesthouse or Hotel Hali. 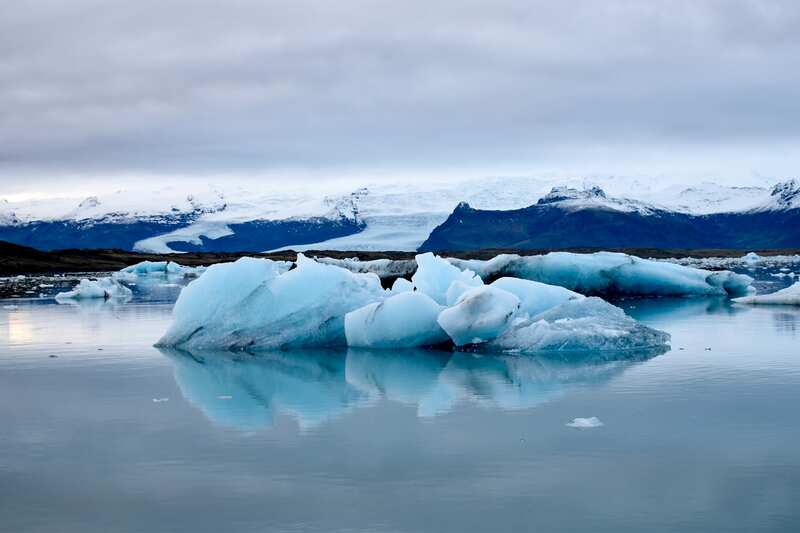 When we are ready to go, we will head to one of our all-time favorite locations in Iceland, the Jökulsárlón glacier lagoon. 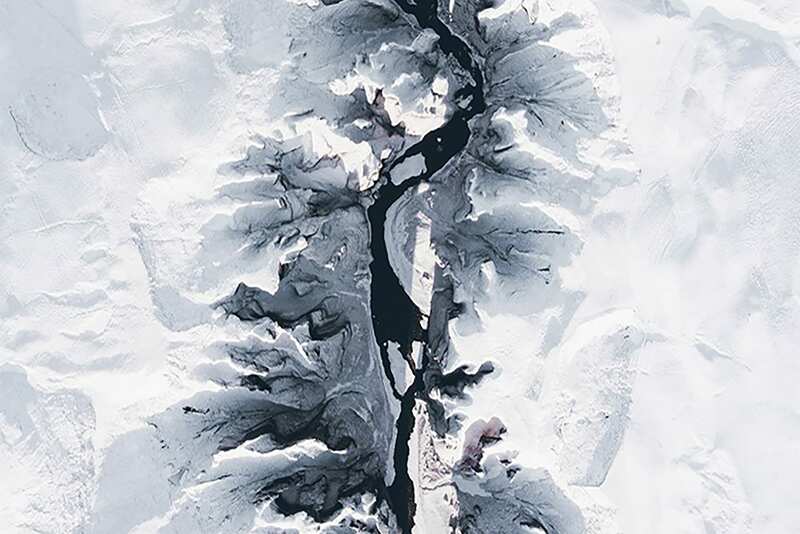 Let the giant icebergs floating around this incredible lagoon astound you and spark your sense of wonder. 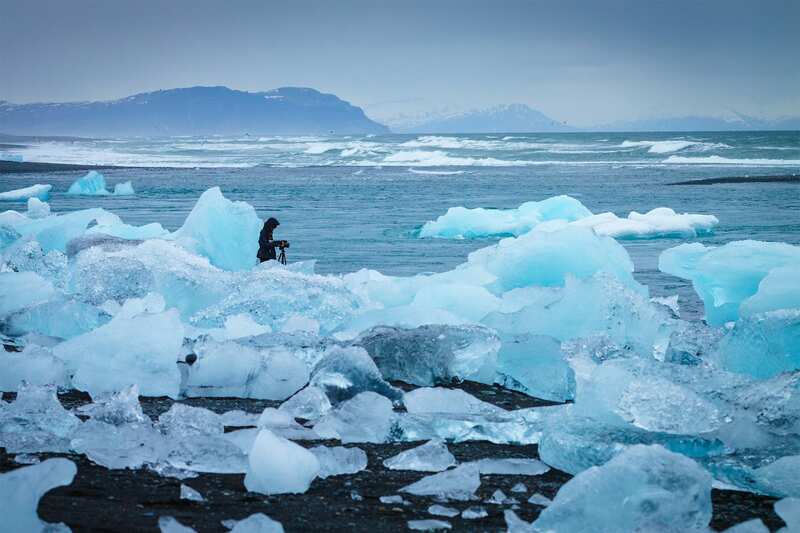 It will be no surprise how 'Diamond Beach' got its name, when you take in your first glimpse of the glistening icebergs that have washed ashore. From here we will meet up with our friends from Vatnajökull, who will be guiding us to the real highlight of the trip, our ice cave adventure. 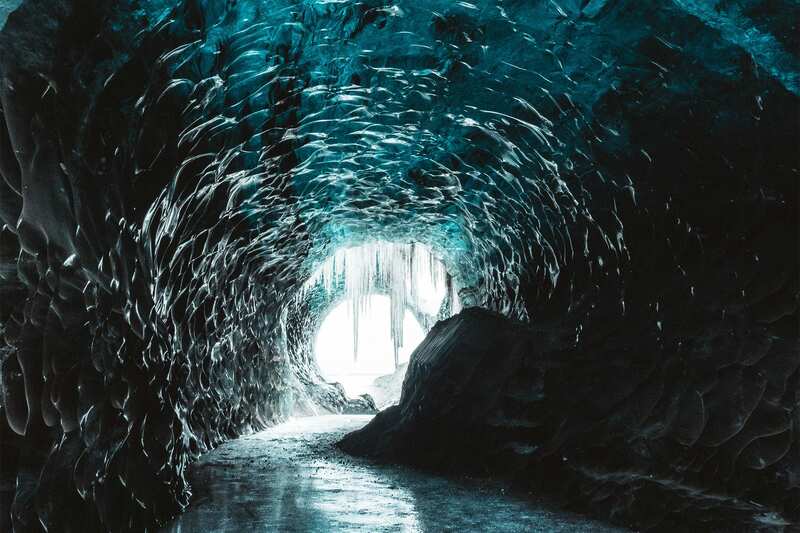 A guided tour with Vatnajökull gets us to a remote part of the glacier in their amazing and capable jeeps, so we can access one of the more secluded ice caves in the region. From the jeep we will hike across the astonishingly beautiful blue ice to reach the ice caves. The hike is considered moderate difficulty, and the entire tour lasts for around 5-6 hours. 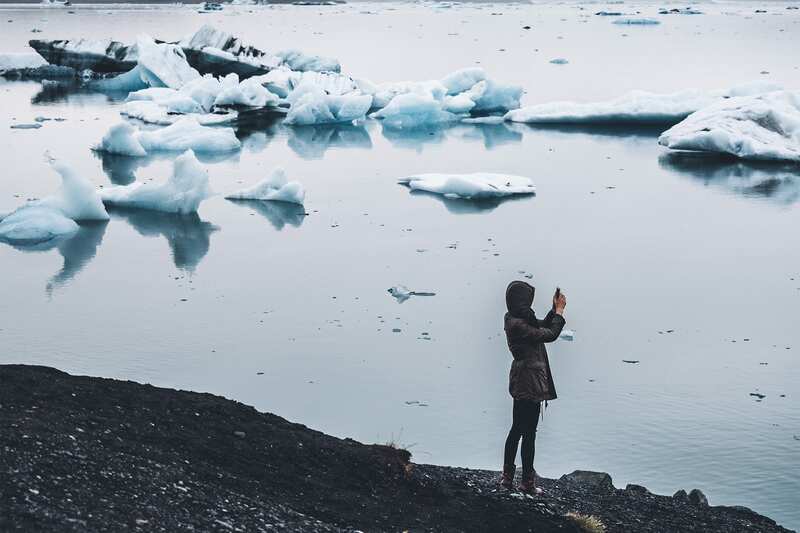 Within this time we take a 35-40 minute drive from Jökulsárlón glacier lagoon to reach the front of the glacier. From here we hike for around 1 – 1.5 hours to reach the ice cave. 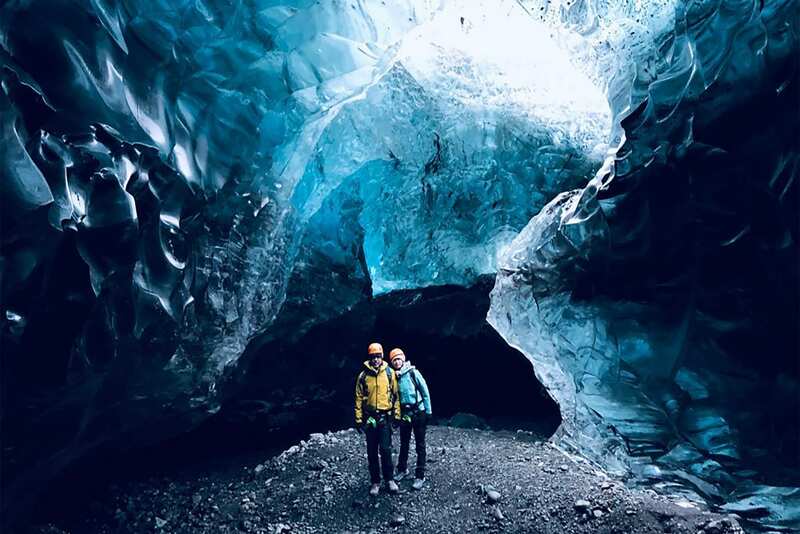 We will spend around one hour in the cave taking in its beauty and snapping photos of its amazing colors and textures.The hike is spectacular and well worth it, allowing the group to see the most amazing blues and textures within the ice cave, and views over the glacier lagoon. This is a highlight of any trip to Iceland. On our way back to Reykjavík we will stop for dinner, before arriving back in Reykjavik around 10:30pm.